Training is an essential part of keeping your food safety standards up to scratch. 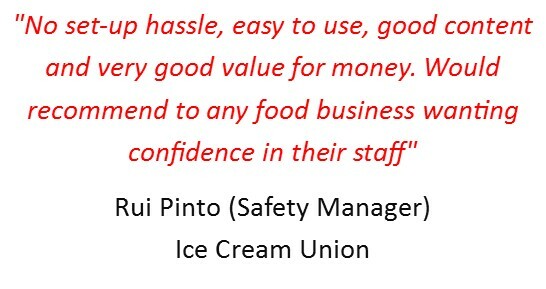 Ensuring your staff are sufficiently trained means they will be better equipped to work alongside your food safety culture, and have the knowledge and expertise to handle food safely, or supervise those who do. All our courses are approved by IOSH, RoSPA and City & Guilds, they are valid for 12 months and we offer discount for multiple purchases. 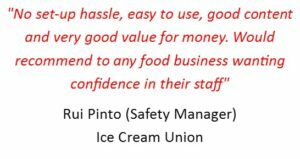 All of our online food safety training courses are approved by UK recognised bodies, such as, CIEH, RoSPA and IOSH at affordable prices. Using online training courses may not have the full benefit of being in a classroom, but time and money doesn’t always allow the luxury. Staff need to be trained efficiently to be able to carry out their job role in a safe manner. We can also offer in house training structured to meet your individual requirements such as: Staff Inductions, Refresher training, Cleaning & the importance, Handwashing, Personal Hygiene allergens and more. For a full list of courses available or for more information Contact us today.